Life seems to have got so busy. It feels like I hardly get a moment off – and, from what I hear, an awful lot of people feel the same way. Rather than rushing around trying to cram more and more into every day, I’ve decided to take a little time out and do some magic to help get my life back in balance. The equinox, when the days and nights are are equal length, is the perfect time to do spells for balance – so here is a candle spell to help. 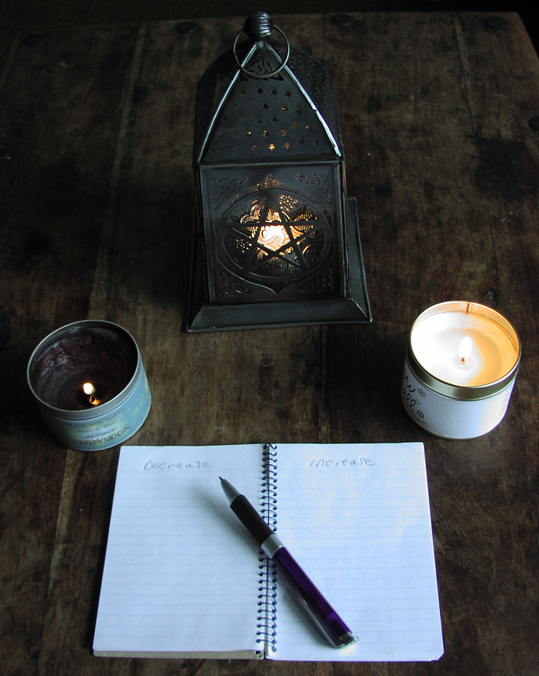 All you really need is a notebook, a pen and two candles. Ideally it should be one black and one white candle, but black candles aren’t always easy to get so you could use any dark coloured candle and any light coloured one. You light the candles then sit down with your notebook and make two lists; one of things you want to make more time for in your life and the second of things you want to spend less time doing. But before you put pen to paper, think long and hard about what it is you really want in your life and what is just wasting your energy. Personally, I know I should spend a lot less time on pointless things on Facebook. I’m not going to give up chatting to my friends on social media, but some discussions – particularly the ones that become heated over nothing – can go. I reckon I could free up a good hour in my day to do things that make me happy rather than just wind me up. And talking about what you can do in an hour – tonight, from 8.30pm to 9.30pm – is Earth Hour, when people all over the world switch off the lights and unnecessary electric gadgets and do things by candlelight to show they care about the future of the planet. This candle spell would be something you could do for Earth Hour. After you have finished your spell, put your lists somewhere you will see them and be reminded of them, to keep up with your good intentions. My book Pagan Portals - Candle Magic: A Witch's Guide to Spells and Rituals has details of lots of other spells you could try by candlelight for Earth Hour - or any other time.